Kairos is that critical point in time when a crisis or rupture opens up and is catalysed with human will to create new potentials. Spring Workshop has been a five-year journey in the accelerated metropolis that is Hong Kong. As we run around in our daily lives, jumping from station to station, hopping on and off the tram, going from hot to cold in a taxi, what do we miss when we go  through  places on the journey from A to B? The 39-year old Pang Jai fabric market in Sham Shui Po is one of  those  places, hidden behind tall banyan trees, sheltered with layers of waterproof fabrics and, in these two past years, an exterior covered in banners and messages to the government. Despite this struggle, inside this architectural odyssey one finds a maze of unique and discontinued fabrics, and a friendly community of 50 fabric sellers and  seamstresses – some as old as 84 years old. 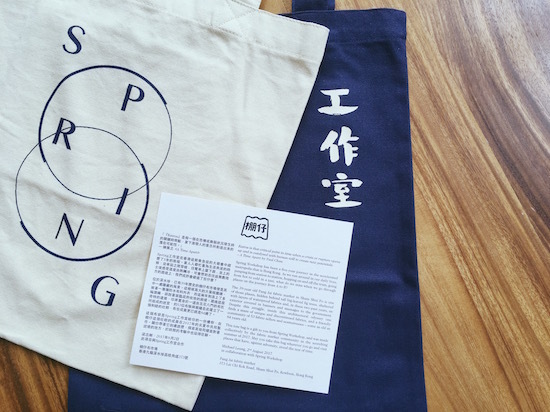 This tote bag is a gift to you from Spring Workshop, and was made collectively by the fabric market community in the scorching summer of 2017. May you take this bag wherever you go and visit places that have, against adversity, stood the test of time.